A shoot rises from the wet, fertile-scented earth, crisply green and strong. Soon exuberant pink, in the shape of the sun, bursts from the stalk. The bloom does not live to be admired; it is simply perfect, as are all the flowers, grasses, and ivies that gloriously come forth around it in their mustardy glow and wandering curiosity. And so beauty grows in a field in northern Michigan. Every summer for four decades, I have vacationed in a cabin across from a field that is home to grass, poison ivy, and dirty golden wildflowers, except for one year only. 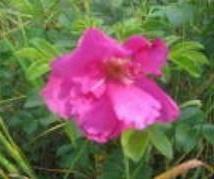 One August, a single wild rose bloomed all alone in a corner of the field. It was the only patch of florist-bouquet color there and the lone wild rose I could find in the area except for a sister flower on a resort island ten miles away. That island is renowned for its bountiful, well-mannered gardens, but it is the field’s single wild rose that I have remembered all these years. The acre’s placid calm belies the ecological stresses that make its naturally rocky soil and short growing season even more inhospitable. It is bounded by barren rocky roads and neighboring sections clear cut for lumber or hunting. Alien species are driving out native plants and wildlife, upsetting the balance upon which many species depend. Increasingly unpredictable weather threatens the growing seasons and water cycles. Yet the wild rose’s seed still traveled to this field and made it home. Though the rose might have grown bigger and had more blooms in the island’s better fertilized and coddling home, I found the flower’s blossoming ecstasy richer for its determination to grow wherever it had landed. Years later, that thought has remained with me and has played a role in how I view life. I am surrounded by a kind of beauty that, like the wild rose, buds and blooms from the soil of conflict and heartbreak. As I write, I listen to melodic and graceful traditional Tibetan music created to bring its listeners peaceful contentment while the singer’s culture at home is under siege. The women from the previously warring tribes of Rwanda joined into one community to support their families by making the colorful and whimsically shaped basket that sits on my file cabinet. Only weeks ago, Haitian women and men who lost everything in the earthquake still sang their national anthem as they lay injured in tent hospitals. When I open my mind and my memory even more, I see that the beauty of the wild rose not only persists in the face of desolation but also can be a gift of liberating power when we feel most empty-handed. In the 1980s, I was in my early twenties and lived near Greenwich Village. As AIDS devastated so many lives in my neighborhood, funerals became part of daily life among friends and work colleagues. For years, the residents of the Village have held a massive Halloween parade. One year, as I watched a jazz band dance down the street, as vibrantly costumed marchers laughed and sang, as flowers flew and onlookers cheered, I realized that every other day, the community fought and mourned but that on this day, the community was defying death with music and dance and color. The loud, joyful message was clear: you may ravage our bodies, but you will never defeat our spirits. The beauty of the wild rose is eternal. That moment at the parade has become a part of my thoughts and words for the past twenty-five years even though many of the marchers are long gone. Just as the grace of Tibetan culture has brought the plight of one small country into the headlines, lovely baskets travel across the world from Rwanda rather than hate, and the singing of the Haitian people will define the Haitian spirit all over the world long after Port-au-Prince is rebuilt. The beauty of the wild rose is not judgmental. It does not say, “this being is beautiful and this one is not.” Rather, it celebrates each individual. Have you ever seen an ugly rose? Even when they shrivel and turn brown, a poignant, delicate artistry in the withered petals can still be found. All of the plants in the field seem beautiful once I release the labels “weed” and “flower“ from my vocabulary. And if each plant is uniquely exquisite, is it not the same with us also? Most of our days are not lived in catastrophe, though. So what would my daily life be like if I and the rest of the world truly believed in the power of a lasting beauty that gives courage and celebrates each being and the earth? Every morning I would look in the mirror and appreciate that the increasing softness of my aging face makes me look so much more welcoming than I did when I was young. I would go to my human services job and none of the people who come for help would be in my office as the result of discrimination; none of them would have been abused and abandoned by their families. On my commute from work, I’d see only elegant buildings in every neighborhood and pristine landscapes instead of gray brick factories and piles of trash. I would never worry that the flooding of the rivers I pass on the train is part of a long-term ecological pattern but would, instead, merely enjoy the view. I have never known these experiences, but I am sure my life would be far different from the one I live now. We all have an image of what a world lived under the rule of beauty could be, for almost every utopia imagined places this powerful vision of beauty where selfish coercion resides in our own world. It is there for us and within us, but perhaps we just don’t believe in it enough to give away the security of thinking the way we always have, even when doing so threatens our own well being and that of the earth. A wild rose blooms in northern Michigan. As trees are felled around it, as the earth heats around it, as invasive purple loosestrife inches nearer to it, a wild rose blooms in northern Michigan. It is a beacon of beauty, a light to another world, a slight jar in the door out of desolation so that it does not slam shut on goodness and beauty and peace. Beauty is a revolution waiting for all of us, every day. I was extremely pleased to find this website. I want to to thank you for ones time for this particularly fantastic read!! I definitely really liked every bit of it and I have you bookmarked to look at new stuff on your website. Youre so cool! I dont suppose Ive read something like this before. So good to find anyone with some authentic thoughts on this subject. realy thanks for starting this up. this website is one thing that is wanted on the internet, somebody with a little originality. helpful job for bringing something new to the web!